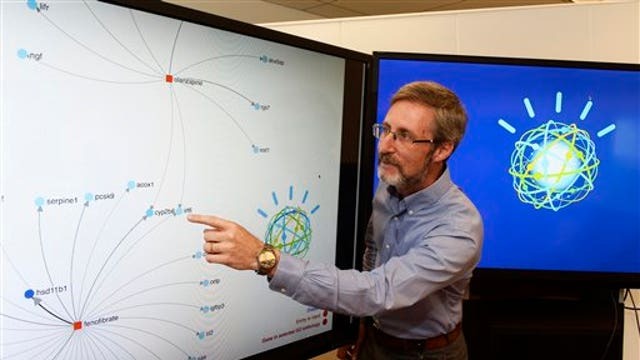 IBM Watson Group vice president John Gordon outlines Watson’s new developments. International Business Machines Corp on Wednesday launched a computer system that can quickly identify patterns in massive amounts of data, an ability that IBM said should hasten breakthroughs in science and medical research. The computer system, Watson Discovery Advisor, understands chemical compound interaction and human language and can visually map out connections in data, the company said in a statement. IBM will make the service available through the cloud. Some researchers and scientists have already been using Watson Discovery Advisor to sift through the sludge of scientific papers published daily. Johnson & Johnson is teaching the system to read and understand trial outcomes published in journals to speed up studies of effectiveness of drugs. Sanofi, a French pharmaceutical company is working with Watson to identify alternate uses for existing drugs. "On average, a scientist might read between one and five research papers on a good day," said Dr. Olivier Lichtarge, investigator and professor of molecular and human genetics, biochemistry and molecular biology at Baylor College of Medicine. He used Watson to automatically analyze 70,000 articles on a particular protein, a process which could have taken him nearly 38 years. "Watson has demonstrated the potential to accelerate the rate and the quality of breakthrough discoveries," he said.